Called "Talon" by London's Metropolitan Police, the barbs are designed to puncture and grip the tires, while the plastic netting becomes entangled in the vehicle's front wheels, bringing the driver to an abrupt stop. Road-top mats called Talon with steel spikes by British Police in effort to foil vehicular attacks. 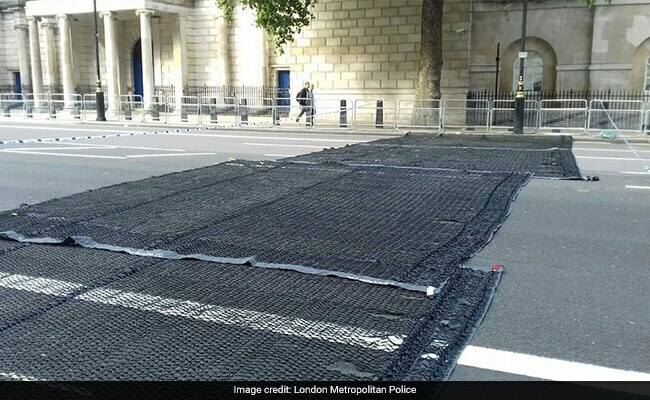 LONDON: Scotland Yard is deploying the latest in anti-terrorism equipment designed to thwart vehicle attacks - a futuristic net bristling with tungsten steel spikes that security forces can quickly lay down like a carpet on a roadway. The concept would be familiar to anyone who has watched the Spiderman movies. Metropolitan Police deployed Talon for the first time at a parade by active-duty sailors and naval veterans in the Whitehall section of central London on Sunday. Authorities say the barbed mats are "likely to become a familiar sight at events that attract large crowds in London." Police said the road-top mats can be deployed by just two officers in less than one minute and can effectively stop vehicles heavier than a London double-decker bus. "The speed and low manpower required for deployment means that the nets can be relocated very quickly if necessary," a police spokesman said. The nets are designed as an improvement on traditional spike strips - known as "stingers" - that have been deployed by militaries and police for years to end car chases and protect checkpoints by blowing out the tires. With the Talon nets, a police statement said, "the vehicle skids in a straight line significantly reducing risk to crowds and producing a well controlled stop after which officers can engage with the driver." The nets are designed to protect people from the kind of vehicle attacks that have plagued Europe in recent times. The vehicle attacks are easy to commit and require little more than a willingness to kill, the ability to drive, and access to a car or truck. A lone terrorist driving a vehicle struck London's Westminister Bridge in March, killing four pedestrians and a police officer. Members of a terrorist cell rammed their rented van into crowds at the London Bridge in June, before jumping out of the vehicle and stabbing merrymakers at the Borough Market. Eight people were killed. A right-wing extremist plowed his car into a group of Muslim worshipers in June, striking a sick elderly man, who later died. Last month, 22-year-old Younes Abouyaaqoub drove a rented van down the center of a popular boulevard in Barcelona, killing 14. In 2016, Mohamed Lahouaiej-Bouhlel killed 86 people in Nice, France, driving through seaside crowds on Bastille Day. Anis Amri plowed into a Christmas market in Berlin last year, killing 12. Metropolitan Police Chief Inspector Nick Staley said, "This equipment undoubtedly has the potential to save lives and is just one of a number of measures being taken to provide protection to crowds attending major events in London and reassuring businesses, workers and visitors as they go about their daily lives." "Hostile vehicle mitigation barriers" - meaning barricades and bollards - have been erected on nine London bridges and other soft targets.